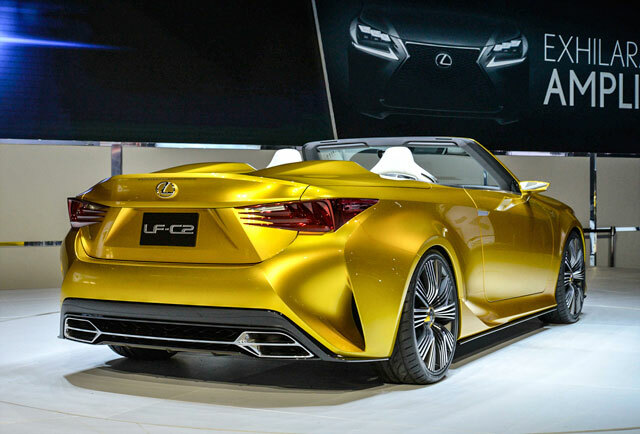 Report: No Production Model for Lexus LF-C2 Convertible Concept? In fact, under the original plan, the RC Convertible was set to be the next all-new car in Lexus’ lineup. As convertibles make up 1 percent of the total U.S. Market, though, the decision to not do a 3-row RX crossover and go with a convertible infuriated the dealers into some sort of angry revolt. Lexus dealers have been howling for a three-row crossover. The result of the revolt is that Lexus has just begun work on a three-row crossover based on the upcoming LS platform. As that’s a rear-wheel-drive platform, this will make the upcoming Lexus vehicle competitive with the likes of the aforementioned Mercedes GL and Audi Q7, as well as the Infiniti QX80. Why Lexus had to decide between the convertible and the crossover is not quite clear — there could be no two vehicles less likely to compete with one another. The situation is likely a case of conflicting budgets, but then why display the LF-C2 at all? Some inside Lexus are furious over this decision because the RC was strengthened (made heavier than it had to be) to be a convertible — and as it turns out, that was pointless. Why else would it use the center section from an IS Convertible?